Obesity is now one of the major health problems in developed countries as this is associated with metabolic syndrome and other weight related medical complications that can impact on life expectancy and quality of life. Bariatric surgery has been shown to be the most effective strategy for effective and sustainable weight loss in obese adults. The safety record of surgery, in the right hands, has also been proven. Can these results be replicated to manage obesity in adolescents and teens? cultural factors. Only less than 1% may be secondary to an underlying endocrine or medical condition, but these conditions should be routinely excluded by clinical review and appropriate investigations. Genes do play a part. The chance of a child becoming obese is about 50% if one parent is obese, and 80% if both parents are obese. However, it is important to emphasise to the family that it is not “all in the genes. Lifestyle factors, such as dietary habits and exercise, do play an important role and are cornerstones of behavioural changes for weight management. Many parents believe that their obese child will “grow out” of their “puppy fat”. Unfortunately the converse is true. Studies have shown that obese adolescents have an 80% chance of becoming obese adults. Moreover they carry similar risks obese adults have of developing, at an early age Type 2 diabetes, hypertension and other weight related co-morbidities shown in Table 1. They are also at lifelong risk for other psychosocial consequences that impairs quality of life. Treatment of obesity at the adolescent level helps to improve long term health outcomes and is best approached with a multidisciplinary team that includes a paediatric endocrinologist, nutritionist, psychologist, and bariatric surgeon. Although non-invasive and family-based approaches are first line, studies have shown their success rates to be poor. The outcomes of control groups treated with placebo and behavioural therapy in randomised pharmacological studies typically show a weight loss of less than 3%. The use of agents such as sibutramine and orlistat shows only a modest improvement in outcomes. When should surgery be offered? A staged approach leading to surgery is recommended if conservative measures fail, but the difficulty lies in identifying the group of young patients who will best benefit from intervention. The indications for weight loss surgery in adults are very clearly defined, and are based on the Body Mass Index (BMI), co-morbidities and to a certain extent, ethnicity. Assessment of what excess weight may be, becomes more complex in adolescents as both weight and BMI percentile curves increase with age and vary by gender. 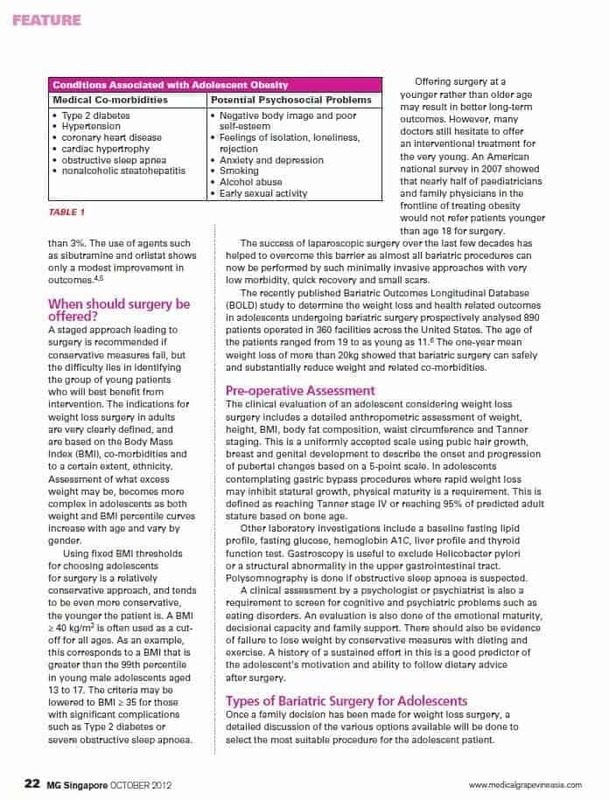 Using fixed BMI thresholds for choosing adolescents for surgery is a relatively conservative approach, and tends to be even more conservative, the younger the patient is. A BMI 240 kg/m2 is often used as a cut-off for all ages. As an example, this corresponds to a BMI that is greater than the 99th percentile in young male adolescents aged 13 to 17. The criteria may be lowered to BMI 2 35 for those with significant complications such as Type 2 diabetes or severe obstructive sleep apnoea. Offering surgery at a younger rather than older age may result in better long-term outcomes. However, many doctors still hesitate to offer an interventional treatment for the very young. 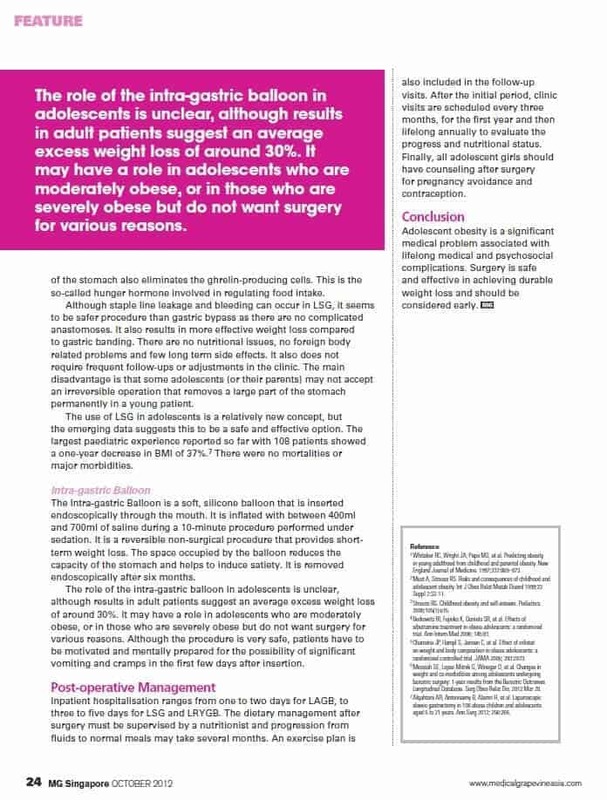 An American national survey in 2007 showed that nearly half of paediatricians and family physicians in the frontline of treating obesity would not refer patients younger than age 18 for surgery. The success of laparoscopic surgery over the last few decades has helped to overcome this barrier as almost all bariatric procedures can now be performed by such minimally invasive approaches with very low morbidity, quick recovery and small scars. The recently published Bariatric Outcomes Longitudinal Database (BOLD) study to determine the weight loss and health related outcomes in adolescents undergoing bariatric surgery prospectively analysed 890 patients operated in 360 facilities across the United States. The age of the patients ranged from 19 to as young as 11.6 The one-year mean weight loss of more than 20kg showed that bariatric surgery can safely and substantially reduce weight and related co-morbidities. defined as reaching Tanner stage IV or reaching 95% of predicted adult stature based on bone age. Other laboratory investigations include a baseline fasting lipid profile, fasting glucose, hemoglobin A1C, liver profile and thyroid function test. Gastroscopy is useful to exclude Helicobacter pylori or a structural abnormality in the upper gastrointestinal tract. Polysomnography is done if obstructive sleep apnoea is suspected. A clinical assessment by a psychologist or psychiatrist is also a requirement to screen for cognitive and psychiatric problems such as eating disorders. An evaluation is also done of the emotional maturity, decisional capacity and family support. There should also be evidence of failure to lose weight by conservative measures with dieting and exercise. A history of a sustained effort in this is a good predictor of the adolescent’s motivation and ability to follow dietary advice after surgery. 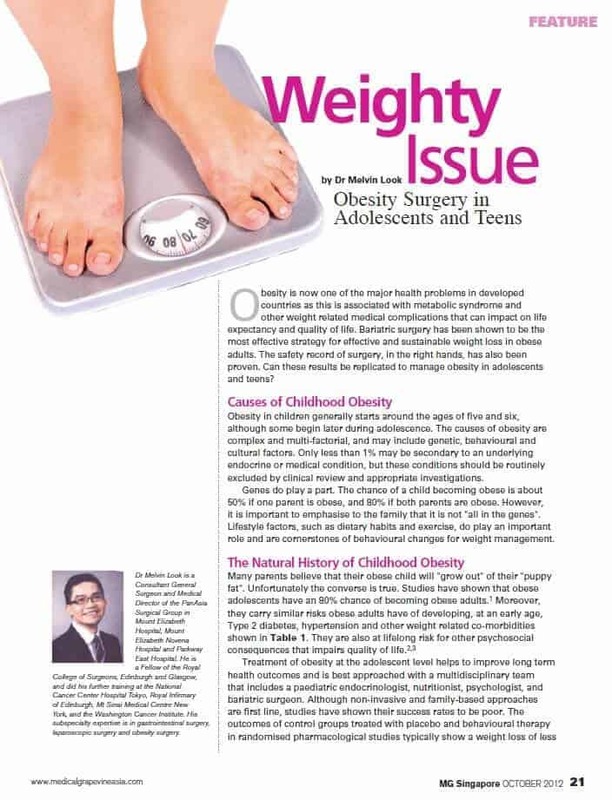 Once a family decision has been made for weight loss surgery, a detailed discussion of the various options available will be done to elect the most suitable procedure for the adolescent patient. The Laparoscopic Roux-en-Y Gastric Bypass (LRYGB) has been one of the most popular weight loss procedures since the 1960s. A row of surgical staples divides the stomach into a small proximal pouch that is excluded from the rest of the stomach remnant [see Figure 1]. The pouch is connected to the distal small bowel via a Roux-en-Y gastro jejunal bypass, effectively adding a malabsorptive component to the food restriction induced by the limited (about 30ml) capacity of the gastric pouch. The weight loss results after LRYGB is excellent, with an average one-year post-operative reduction in BMI of around 37%. The trade-off is higher incidence of side-effects such as dumping and nutritional problems caused by the malabsorption. These include deficiencies in iron, vitamin B12, vitamin D, and thiamine which may require lifelong supplements. There is also a theoretical objection to bypassing the stomach in Asians as there is a moderate population risk of gastric malignancies when the adolescent enters adult life. This operation precludes future entry into distal stomach should endoscopic evaluation be required. 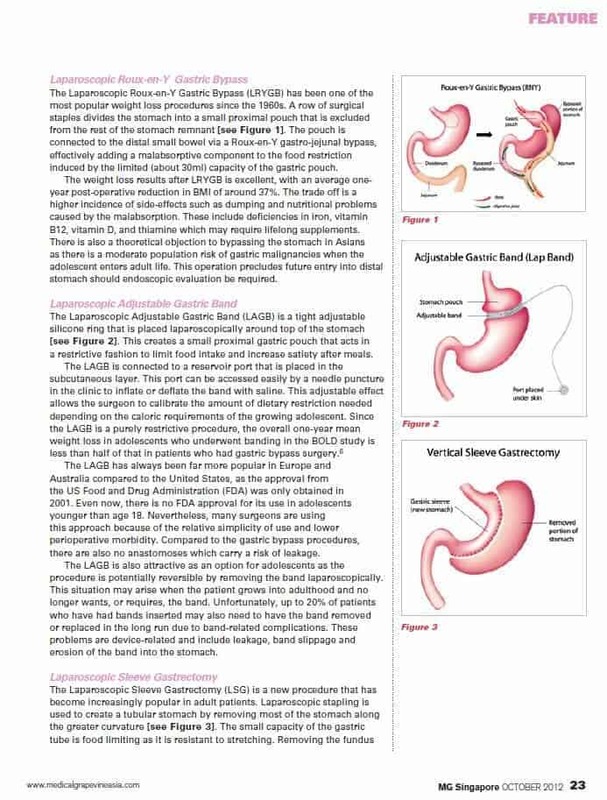 The Laparoscopic Adjustable Gastric Band (LAGB) is a tight adjustable silicone ring that is placed laparoscopically around top of the stomach [see Figure 21]. This creates a small proximal gastric pouch that acts in a restrictive fashion to limit food intake and increase satiety after meals. The LAGB is connected to a reservoir port that is placed in the subcutaneous layer. This port can be accessed easily by a needle puncture in the clinic to inflate or deflate the band with saline. This adjustable effect allows the surgeon to calibrate the amount of dietary restriction needed depending on the caloric requirements of the growing adolescent. Since the LAGB is a purely restrictive procedure, the overall one-year mean weight loss in adolescents who underwent banding in the BOLD study less than half of that in patients who had gastric bypass surgery. The LAGB has always been far more popular in Europe and Australia compared to the United States, as the approval from the US Food and Drug Administration (FDA) was only obtained in 2001. Even now, there is no FDA approval for its use in adolescents younger than age 18. Nevertheless, many surgeons are using this approach because of the relative simplicity of use and lower perioperative morbidity. Compared to the gastric bypass procedure there are also no anastomoses which carry a risk of leakage. The LAGB is also attractive as an option for adolescents as the procedure is potentially reversible by removing the band laparoscopically. This situation may arise when the patient grows into adulthood and no longer wants, or requires, the band. Unfortunately, up to 20% of patients who have had bands inserted may also need to have the band removed or replaced in the long run due to band-related complications. These problems are device-related and include leakage, band slippage and erosion of the band into the stomach. The Laparoscopic Sleeve Gastrectomy (LSG) is a new procedure that has become increasingly popular in adult patients. Laparoscopic stapling is used to create a tubular stomach by removing most of the stomach along the greater curvature [see Figure 31. The small capacity of the gastric tube is food limiting as it is resistant to stretching. Removing the fundus of the stomach also eliminates the ghrelin-producing cells. This is the so-called hunger hormone involved in regulating food intake. Although staple line leakage and bleeding can occur in LSG, it seems to be safer procedure than gastric bypass as there are no complicated anastomoses. It also results in more effective weight loss compared to gastric banding. There are no nutritional issues, no foreign body related problems and few long term side effects. It also does not require frequent follow-ups or adjustments in the clinic. The main disadvantage is that some adolescents (or their parents) may not accept an irreversible operation that removes a large part of the stomach permanently in a young patient. The use of LSG in adolescents is a relatively new concept, but the emerging data suggests this to be a safe and effective option. The largest paediatric experience reported so far with 108 patients showed a one-year decrease in BMI of 37%.7 There were no mortalities or major morbidities. The role of the intra-gastric balloon in adolescents is unclear, although result in adult patients suggest an average excess weight loss of around 30%. It may have a role in adolescents who are moderately obese, or in those who are severely obese but do not want surgery for various reasons. The Intra-gastric Balloon is a soft, silicone balloon that is inserted endoscopically through the mouth. It is inflated with between 400ml and 700ml of saline during a 10-minute procedure performed under sedation. It is a reversible non-surgical procedure that provides short-term weight loss. The space occupied by the balloon reduces the capacity of the stomach and helps to induce satiety. It is removed endoscopically after six months. The role of the intra-gastric balloon in adolescents is unclear, although results in adult patients suggest an average excess weight loss of around 30%. It may have a role in adolescents who are moderately obese, or in those who are severely obese but do not want surgery for various reasons. Although the procedure is very safe, patients have to be motivated and mentally prepared for the possibility of significant vomiting and cramps in the first few days after insertion. Inpatient hospitalisation ranges from one to two days for LAGB, to three to five days for LSG and LRYGB. The dietary management after surgery must be supervised by a nutritionist and progression from fluids to normal meals may take several months. An exercise plan is also included in the follow-up visits. After the initial period, clinic visits are scheduled every three months, for the first year and then lifelong annually to evaluate the progress and nutritional status. Finally, all adolescent girls should have counselling after surgery for pregnancy avoidance and contraception. Adolescent obesity is a significant medical and psychosocial complications. Surgery is safe and effective in achieving durable weight loss and should be considered early. Make an appointment with PanAsia Group and meet Dr. Melvin Look for consultation.